Wheelchairs on the Go: Accessible Fun in Florida: This new book by Michelle Stigleman & Deborah Van Brunt packs hundreds of great tips. Click here to read a review. Wheelchairs on the Beach: A list of locations where wheelchairs built for beach conditions are available for rent. Handicapped Travel Club offers links to RV manufacturers and conversions options and guidelines for making an RV camping spot accessible for disabled road trippers. 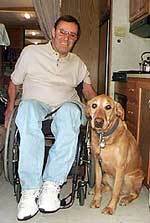 For inspiration, read the story of Chuck Bosch and his dog Buster. Enablemart offers Dashboarding and lifestyle products that can help overcome some mobility and dexterity losses when using electronic devices like computers and telephones. Lists of companies that can customize vehicles of all types for the mobility-impaired are online at rv-info.net.